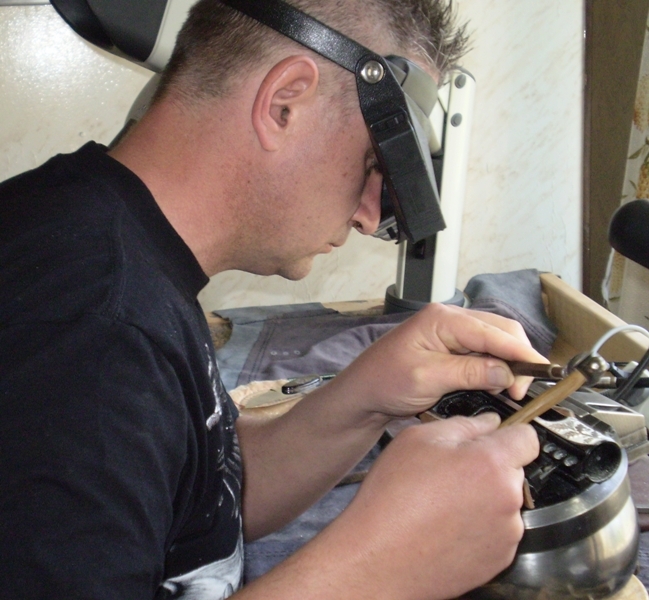 My name is Stefan Albert, I am 40 years old and I live in a small Slovakian town called Filakovo . I have always been amazed with the miracles of nature and animal world. 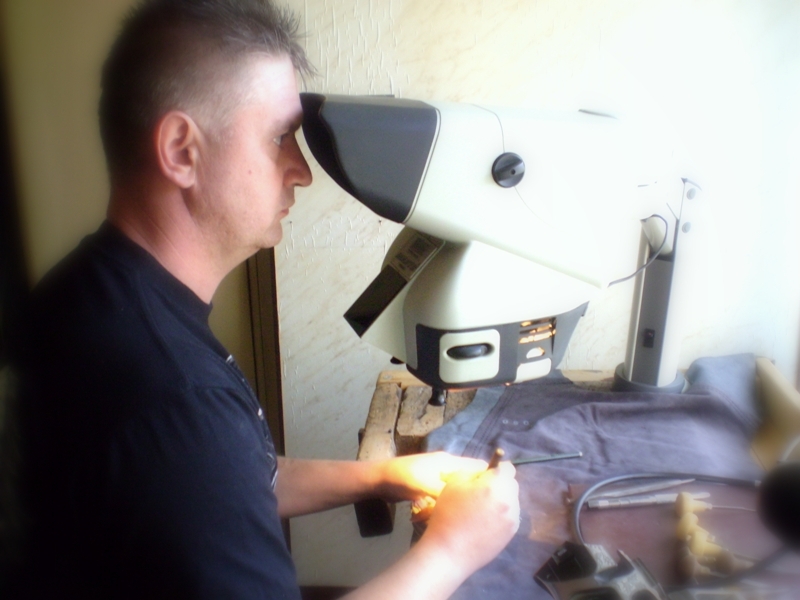 Unfortunately I couldn’t continue my studies as a graphic or engraver, but I have never given up my dreams. I started engraving 10 or 11 years ago. At an early stage I was getting acquainted with wood and bone, then I continued with making knives for friends. I have gradually grown to acquire different technologies and met wonderful people who introduced me willingly the hard but yet amazing world of steel, giving me useful advice. 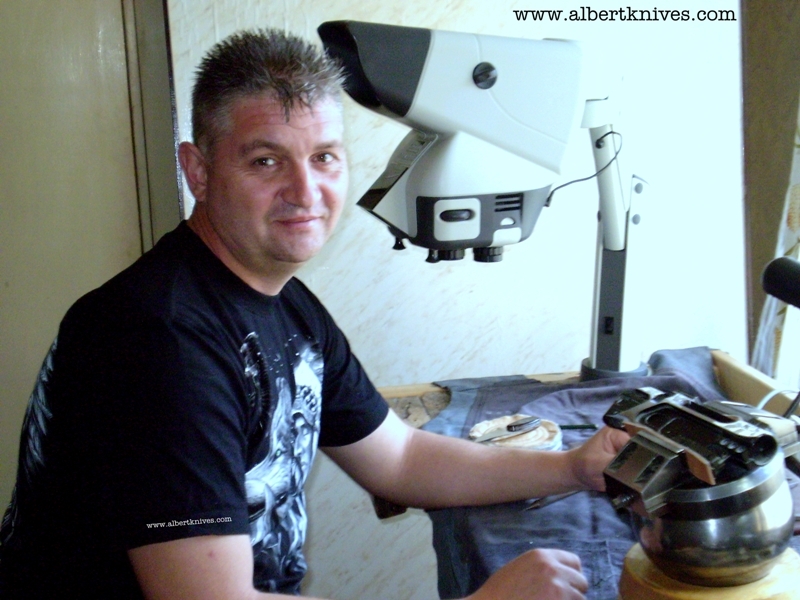 At first I must mention one of the leading masters of knifemaking in the world, Árpád Bojtos, who has always been not only a fantastic master but also a real friend. I have attended different exhibitions where I could meet new frienships and new experiences. I practised on my own, my successes and failurs led me to see into new dimensions of my work. I have always been allured by new technologies, so I started to deal with scrimshaw and bulino. I gradually created my own style what I tend to develope and improve. I am trying to follow the path I fancied for myself however it can be thorny, there are wondreful people standing by me – especially my family: my wife Veronika and my son Dávid. They are the ones who can first see my works, and thus they critisise them as first. I will be totally satisfied if they can be proud of my work, as they are the ones who can see not only the ready product but the long process of the work lasting even months,too. I use various materials for my knives: steels 440 C, ATS-34, RWL, Damasteel and different damasts. The handle material also can be any wood or bone, gems or semi-precious stones. However my favourite materials are those who I can scrimshaw, like tusk of mamut or elephant, horn of buffalos, or even tusk of morse, wart-hog, and occasionally tooth of hippopotamus. I also find a lot of pleasure in making miniature knives. As I cannot stop drawing and I like challenges, I prefer portraits the most, making them usually with scrimshaw. I try to make everything on my own but my most beloved technologies are the deep engraving and the coloured negative scrimshaw. 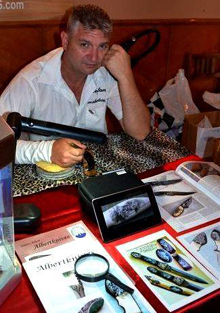 My knives can be found in several countries of the world: Slovakia, Czek Republic, Hungary, Germany, South-Africa, Sweden, Canada. I have managet to get to important exhibitions, but I aim to attend an exhibition in the U.S. and to try myself there.